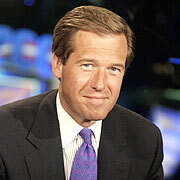 succeeding Tom Brokaw on NBC Nightly News, a historic network changing of the guard that will occur Dec. 2." "'It's the ultimate subjective business,' says Williams, 45. 'We put ourselves on the line and say, 'Please invite us into your home,' and everyone is free to have at it. That's one of the great things about a democracy. People are completely entitled to their opinions, and I go home after the broadcast and go to sleep at night. My wife and children seem to like me quite a bit, and as long as that is truepeople find this amazingI'm really OK.'"
"After spending much of the past year on the road, Williams says, his game plan as anchor of the No. 1-rated U.S. newscast is simple. "'I've got to get out a lot,' he says. 'The New York-Washington axis can be a journalist's worst enemy. Stories have a funny way of sneaking up on you, and the American people have a funny way of deciding what their reality is. You've got to spend a night in Dayton and Toledo and Cincinnati and Denver and in the middle of Kansas.'" Rev. Billy Graham, still crusading at 86: "In a venue better known for football than fundamentalism, 78,000 people crowded inside the Rose Bowl this past Friday nightnot to see a rock star, but 86-year-old Reverend Billy Graham, recovering from a broken pelvis, who many fear they won't get to see again." Blowing the whistle on fraud against government yields big rewards: "Crime may not pay, but blowing the whistle on companies that swindle the government sure can. "Jim Alderson got $20 million in one settlement and split $100 million with another whistleblower in a related case, both involving Medicare fraud by the nation's largest for-profit hospital chain and a company it acquired. "Once facing a wrecked career and no pension, Alderson, 58, now owns houses in Plano, Texas, and Whitefish, Mont., drives a new Thunderbird and has established a charitable foundation with the money he received. While his pastures became greener after long legal battles, blowing the whistle was no easy ride into the sunset. "'You risk everything when you do it,' he said. "Alderson is among the beneficiaries of a law passed nearly two decades ago that encourages whistleblowers to come forward by promising them up to a quarter of the money recovered by the government. "Since its inception, the False Claims Act has generated $12 billion for the federal treasury and more than $1 billion for hundreds of whistleblowers." "Established during President Lincoln's time, the law was later gutted. But it was strengthened in 1986 to help identify contractors guilty of defrauding the government." Firefighters See Shifts: "Thanks to better building codes and education efforts, the number of fires across the country has plummeted in the past two decades. At the same time, the number of medical calls has risen sharply, a reflection of an aging population. And in the aftermath of the Sept. 11, 2001, terrorist attacks, there is a heightened emphasis, especially in Washington, on dealing with biological and chemical hazards. "The changing demands have altered the job and culture of firefighting, a profession steeped in centuries of tradition and extolled in books and films that chronicle heroic rescues from burning buildings. Because fire stations are located throughout communities and ambulances are often overtaxed, firefighters are increasingly tapped for medical duties. In more serious cases, they are called upon to stabilize patients until ambulances arrive. "Some even wonder if firefighters should be called firefighters anymore." Evacuation of volcano-hit Papua New Guinea island gets underway: "An urgent evacuation of around 9,000 villagers from Papua New Guinea's remote Manam Island got underway amid fears the the island's volcano was on the verge of a major eruption, officials said. "The first batch of hundreds of islanders were taken off the island by container boat in the morning, an official coordinating the evacuation told AFP from the remote community of Bogia, where the islanders are to be taken. "'It is on its way to Bogia,' disaster relief official John Bivi said, when asked about the boat's progress. He said the islanders were in relatively good shape despite the lack of food." Volcanic activity interrupts work: "The Bible teaching and translation ministries of missionaries Alton and Cheryl Shady have been interrupted by a volcanic eruption. "Residents of Manam Island have begun to evacuate after an eruption Tuesday night that threw ash up to 6 miles (10 kilometers) in the air. "Alton and Cheryl do not see any immediate danger for their Zogari village area, but are concerned by some of the panic they see around them." Hong Kong's hi-tech haven: "For decades the latest technology has always found a natural home on Hong Kong's shores. With new competition from the Chinese mainland, Hong Kong has reacted by setting up an hi-tech business hub with superfast wireless internet access. "A technology war is being waged between Hong Kong and its big brother China. "China, which has been watching and learning from the former colony's success, has a battle plan involving Beijing and Shanghai as major draw cards for hi-tech businesses wanting to be at the heart of the China boom. "And the Hong Kong Government has responded swiftly." The Rise and Fall of the Mayan Empire: "Sever and co-worker Dan Irwin have been looking at satellite photos and, in them, Sever spotted signs of ancient drainage and irrigation canals in swamp-like areas near the Mayan ruins. Today's residents make little use of these low-lying swamps (which they call 'bajos,' the Spanish word for 'lowlands'), and archeologists had long assumed that the Maya hadn't used them either. During the rainy season from June to December, the bajos are too muddy, and in the dry season they're parched. Neither condition is good for farming. Sever suspects that these ancient canals were part of a system devised by the Maya to manage water in the bajos so that they could farm this land. The bajos make up 40% of the landscape; tapping into this vast land area for agriculture would have given the Maya a much larger and more stable food supply. They could have farmed the highlands during the wet season and the low-lying bajos during the dry season. And they could have farmed the bajos year after year, instead of slashing and burning new sections of rain forest." may be the most unswerving conservative in the new Senate that convenes on Jan. 3." "Senate Majority Leader Bill Frist, R-Tenn., wants to curb the Senate tradition of the filibuster when Democrats use it to block judicial nominees, but Coburn said Monday when it comes to pork-barrel spending, he considers the filibuster a legitimate way to stop it. "'The history of the Senate shows that on economic issues, the filibuster can at least prolong the debate,' he noted. "He added that it was 'premature right now to say whether that ought to be utilized' and implied that a filibuster on spending measures won't be needed if the Senate leadership does its job in writing sensible appropriations bills." "But Coburn knows that the Senate's 'process'mastery of its rulesmay be the key to his hopes of restraining spending and passing conservative social legislation. "'My goal is to learn the rules as well as Robert Byrd,' he said, referring to the 45-year veteran West Virginia Democrat who has been steeped in the Senate's traditions and procedural minutiae longer than anyone. "Some Senate observers had thought Coburn might be kept in restraint by a veteran chief of staff, but Coburn has chosen Michael Schwartz, a social conservative who recently served as vice president for government relations of the advocacy group Concerned Women for America." "Perhaps one reason Coburn is not afraid to take risks is that he is a two-time cancer survivor, having melanoma in 1975 and colon cancer last year. "'I didn't do this (run for the Senate) because I necessarily wanted to come back up here, I did this because I thought I was supposed to,' he explained Monday, attributing his decision to 'an impression in my spiritual life that that was something I should do.'" The Battle for America: "A battle for America is being waged in our public life in these crucial days. It is more obvious than ever that the spiritual war for the soul of the nation has reached a point of serious escalation. The outcome will likely affect our national life for decades to come."